I adore the flavor of pesto and peas together. In the summer, I make a pasta salad with peas and pesto that is always a crowd pleaser. In times when I desire something a little lighter, I use fresh, chlorophyll-rich spinach instead of pasta. 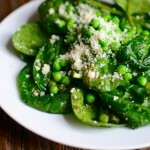 This salad is wonderful any time of the year, but it is especially good in the spring. Most recently I made a huge batch of this for a party of over 50. It was a huge hit! For this salad I used fresh, homemade pesto, but naturally you can also used store-bought. If you’re using store-bought, be sure to buy it freshly made, which you can usually find in small plastic tubs at the deli-counter. If you’re like me and don’t usually have the foresight to defrost your peas, do what I do, which is to carefully blanch the peas in a pot of boiling water for about 10-20 seconds. Once the peas turn loose their frost and become a bright and lively green, drain the water and rinse the peas in cold water to retain their brightness. 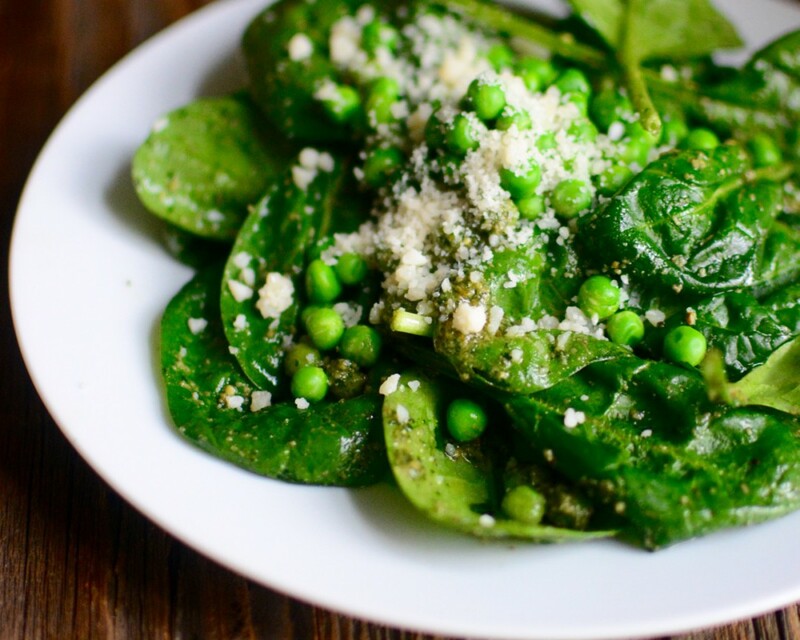 For the salad, combine the peas (be sure they have cooled, otherwise they will brown the pesto and spinach), spinach, sea salt and pepper in a large bowl and toss. Sprinkle on the Parmesan and serve.